Remove the stem from each pepper and cut them in half. Remove the seeds and discard. Preheat the oven to 500 degrees. Place the peppers on a heavy sheet pan and place in the oven for 20 - 30 minutes, or until the skins are very wrinkled and the peppers are slightly charred. Turn peppers at half way point. Very carefully remove the pan from the oven. Set aside to cool. Don't rush this as the peppers will be very HOT!!! 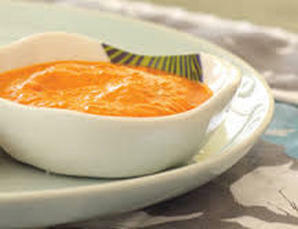 To make the sauce: In a blender or food processor, purée roasted orange peppers and pine nuts. Heat a large skillet over medium heat for 3-4 minutes. Add olive oil, onion and crushed red pepper; cook about 5 minutes, stirring occasionally, but allowing the onions to pick up some brown color from the pan. Stir in garlic, cook for 30 seconds, then add broth; cook for about 2 minutes, or until liquid has evaporated. Let mixture cool a bit before adding to the food processor. Add the parsley, basil, salt and black pepper. Purée all ingredients together in the food processor. Taste and adjust spices as needed. Try this sauce over brown rice pasta, steamed cauliflower or as a dip.